/ Casa-caricati di lusso. Una delle poche unità OVERSIZE nel complesso di condominio! (1480 piedi quadrati. ): Ulteriori metratura nel 2 ° camera da letto e soggiorno. alloggi Letti: King (matrimoniale con bagno), 2 regine (2 ° camera da letto), divano letto matrimoniale, aggiuntivi e presepe. pranzo cucina isola con sgabelli da bar. Totale di 3 TV a colori di in unità. (2 schermi piatti) tavolo e sedie sotto il portico per mangiare all'aperto all'aperto. Gli extra comprendono: Bikes (biciclette 2 adulti), sedie a sdraio, teli mare, racchette da tennis, giochi in piscina (Tagliatelle, secchi di sabbia, ecc), videoteca con oltre 100 film, biancheria completamente attrezzate, pentole e padelle, giochi, frullatore, mixer, friggitrice elettrica, elettrici spremiagrumi, il ghiaccio e frigorifero, sedia di richiamo. We are two retired couples that vacationed for two weeks at Blind Pass condominiums. The grounds were very nicely groomed and the pool was one of the best. This unit while spacious, could use some updating. The woodwork appears to have water damage at one point and was crumbling and moldy. In many areas, the vinyl veneer on cupboards was curling up and coming off. The bathtub in the mater bedroom had rust areas deep in the porcelain. The living room had a sofa and two loveseats that needed to be cleaned, the arms being so caked with dirt that we put towels over them. The beds have very uncomfortable mattresses . The patio table was covered with rust. Never in all our years of traveling have we found so many issues in our rental. We went to the office asking for a different condo. We were told that since this owner was not a member of the group that rents through Blind Pass , they were sympathetic, but unable to help us. We tried to overlook most of this because we had paid in full a year ahead of time which was unusual, but on the 12th day of our stay, I contacted the owner to let her know about the issues. I also asked for some financial compensation as I felt this condo was not worth the price we paid for it. She replied that I should have let her know immediately so she could have sent new furniture over and someone to clean the condo. This was not something that a simple cleaning could help. This had to develop over quite a length of time. She stated that previous reviews were “glowing”. It was noted that it looked like several of the reviews were posted by the owner. We had a great week at Sanibel. The pool and tennis courts are just steps from the patio of the condo. The condo was clean and spacious. The beach was gorgeous. I’d go back in a heartbeat. Provided easy access to print airline boarding passes and was able to answer general questions about the area. The condo itself was very comfortable, great for a family. 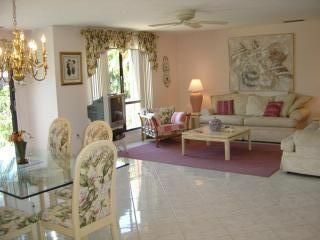 Larger condo and reasonable price. It is a lot outdated and a little cluttered, but if you don’t mind that, it’s a good value. I would not call this “luxury” though. sfogliare, SunSplash parco acquatico, mercato delle pulci. giostre Trolley, noleggio biciclette (abbiamo 2 biciclette per adulti nel nostro armadio). Canoa kayak gratuito e di check-out presso la club house. Wildlife centro di recupero, tartarughe schiusa e classi; passeggiate sulla spiaggia con mercato guida, contadino. Rates quoted are based on Saturday check in and Sat check out. Rates slightly higher for non-Saturday check in days, as owners lose the ability to have weekly back to back rentals. Expect an "up charge" of approx. $20 per night. The security deposit is refundable, based upon return of the keys to owner in return self-addressed envelope, and no damages/theft/assessments caused to unit, no excessive cleaning per exit procedures. Thank you! Deposit refunded to the person paying the deposit. No refunds for cancellations, we suggest that you purchase trip insurance if you are concerned that you may not be able to come or have potential health issues.